So I have been looking around for a specific setup. So here is what I would like if there is one out there. I ended up with a Jaguar HH VM but the body is bigger and I can't really do much with mods because that pickguard and bridge are one offs. 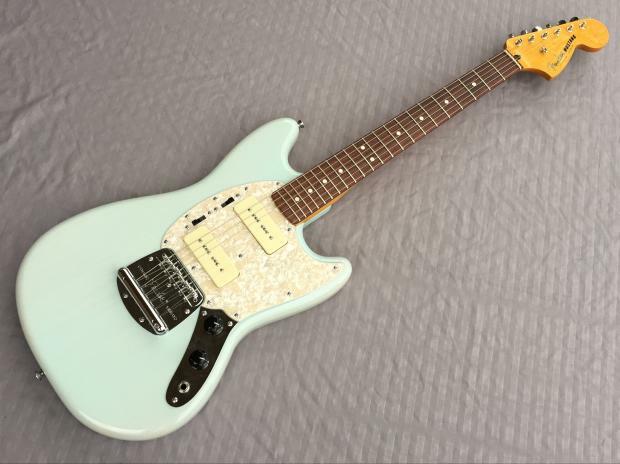 Also there are so many other models out there that Fender/Squier have put out that i am going nuts, Juaguarillo, Jagmaster, Magjaster, Maguar, etc etc and discontinue I don't know what else exists. I would prefer a cheaper model as I know I will end up throwing P90s in it and don't want a Jazzmaster hardtail because they are all regular scale. DuoSonic or DuoSonic II might be up your alley, but you'll pay vintage prices. Squier VM Mustang with the trem locked down. The new (ugly) Surf Mustang model might work... though the paint options aren't there. They made an American Special Mustang fairly recently which was a hardtail and HH. Not sure how cheap one of those would be though and I think they may have only come in Sunburst. Cyclone II? 24"24.75" scale and came in sonic blue and CAR (with competition stripes). Not a hardtail but they had a strat term so fairly easy to lock down. P90s might be an issue though. Pawn Shop Mustang? Not the same body shape as a traditional Mustang but hardtail and HH (with some useful coil splitting options). Probably fairly easy to drop P90s in. Came in LPB, CAR and sunburst (also white in Japan). Pretty sure there have been a couple of recent lower end Jags with P90s (Blacktop / Modern Player) which would also be 24". Only one pickup, but Squier Vista Musicmaster. Has the finish you require too. Cool thanks for the replies. I think when it comes down to it the most economical option that I can upgrade is a VM mustang plus easy to find. Only issue no local ones so I have to get it online. But can one of those fit p90s? the simple solution to that would be to get humbucker-sized p90's. i use gfs versions of that in my hh jag, and it sounds incredible. it's a 20 minute upgrade that costs under $60 for a pair of pickups (i went with a mean 90 in neck and dream 90 in the bridge). I think the closest is probably the DiMarzio SDS-1, I haven't personally tried it though, other than expensive custom P90s in strat size. The cheapest possible is to rout though, cheap P90s can be super cheap. It is easy to block the trem on a jagmaster. I would locate a pawnshop or ebay jagmaster and take it apart completely. 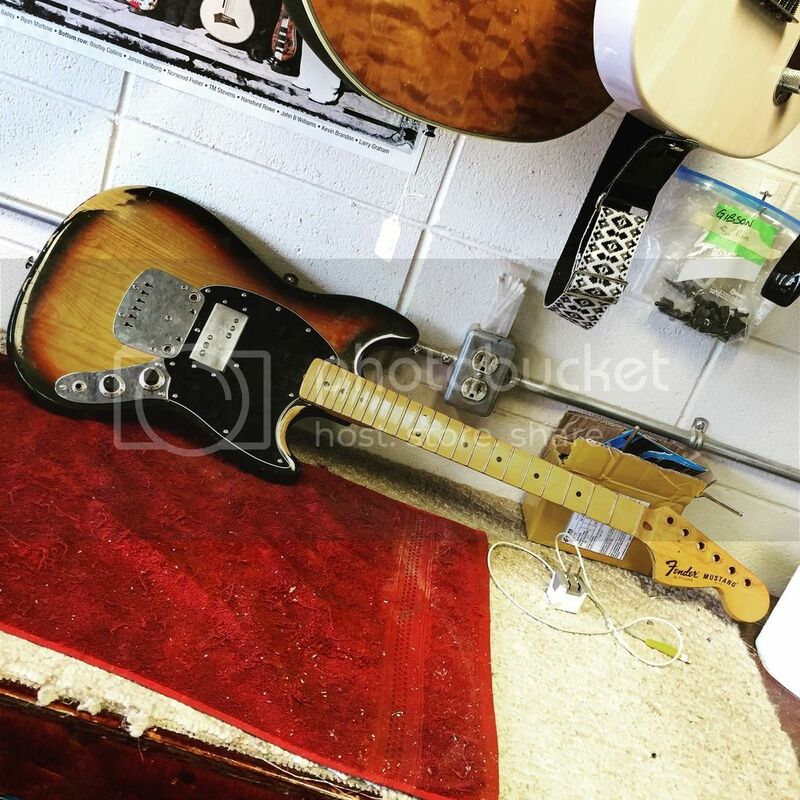 Refinish the body and even paint the headstock to match. Substitute your pickups when you reassemble, maybe get a new pickguard custom made or make one yourself if you don't like tortoise shell. And block the trem with hard wood. And there you are. I like the jagmaster humbuckers, and I have one of those guitars... I think I've just talked myself into a project! I could refinish it in white and keep the stock pickguard. I've already got the trem blocked... yes, why not? Cyclone II? 24" scale and came in sonic blue and CAR (with competition stripes). Not a hardtail but they had a strat term so fairly easy to lock down. P90s might be an issue though. The Cyclones are 24.75 scale, if I recall correctly. ^ Yeah that and the toronado. Of course. You're absolutely correct. I'll edit my original post. You're looking for a Mustang Pawn Shop Special, made in Japan (2011) and Mexico (2012). Hardtail. Two humbuckers, each with coil split switches, a three way, master volume and master tone. You could also search for any of the Cobains, either the Stang or the Jag. I think they're all hardtails, too. Paw shop's a really good idea. It is, build thread in project section. The plate works great but does require some light chisel work for string clearance. IMO it it the cleanest way to hard tail a mustang short of buying a duo sonic body, and will work on any mustang body you can find. Warmoth makes you a Mustang body with a hardtail Toronado route.